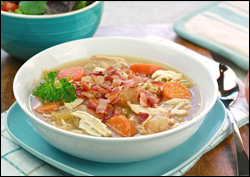 This sweet 'n savory creation is 50 percent soup, 50 percent stew, and 100 percent AMAZING!!! In a slow cooker, combine broth with cornstarch, and stir to dissolve. Add vinegar, garlic, and parsley, and mix well. Season chicken with salt and pepper, and add to the slow cooker. Add all remaining ingredients except bacon, and thoroughly stir. Cover and cook on high for 3 - 4 hours or on low for 7 - 8 hours, until chicken is cooked through. Remove chicken and place in a large bowl. Shred with two forks -- one to hold the chicken in place and the other to scrape across and shred it. Stir shredded chicken into the stew in the slow cooker. Cook bacon until crispy, either in a skillet over medium heat or on a microwave-safe plate in the microwave. (See package for cook time.) Chop or crumble bacon, and sprinkle over each serving!